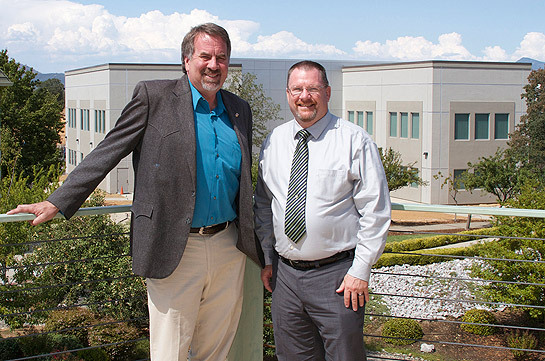 REDDING, Calif. - North State Congressman Doug LaMalfa toured Simpson University’s new Science and Nursing Center this week, visiting with President Robin Dummer. LaMalfa, a Republican from Richvale, has been representing the first congressional district of California in Washington, D.C., since 2013. Last month, California Sen. Ted Gaines and Assemblyman Brian Dahle also toured the newly completed $6.5 million building. Their visit included a discussion about the importance of the Cal Grant student financial aid program. Photo by Mark Buschgens. From left, Congressman Doug LaMalfa and Simpson University President Robin Dummer. The university’s new Science and Nursing Center is in the background.